Enna Burning is the second book in Shannon Hale's Book of Bayern series. Two years after helping her friend Isi take back her rightful place as princess, Enna is back in the forest, tending her family home after her mother's death. One night, her brother Leifer shows up with a strange vellum and the power to conjure fire out of nothing. When he seems to be losing control of this power, Enna goes to Isi. But Isi and Geric are also dealing with serious problems of their own: war is coming to Bayern, and it has put Enna is a very precarious position. 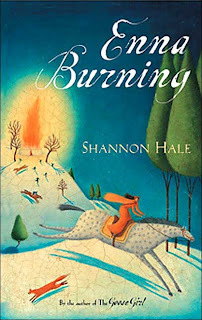 Shannon Hale's sequel to The Goose Girl is a bit more serious as she broaches the topics of war and death, but nonetheless Enna Burning still contains some of the same humorous and lovable characters and magical, enchanting forces that charmed readers of The Goose Girl. Enna's character is strong willed and solid, and her sly sense of humor will appeal to readers. Hale builds suspense throughout the book as Enna and her friends discover their powers aren't what they first appeared, and struggle for a way to end the war. 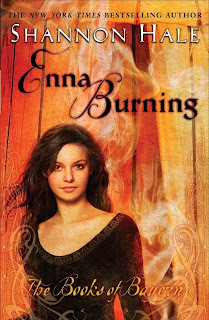 Brisk, exciting, and nicely satisfying, Enna Burning is a wonderful fantasy read. Cover Comments: As with The Goose Girl, I do like the original artwork better. I think it's a really neat style, and so, so pretty. The newest cover is cool too, and I can see how it can appeal to younger readers (though this girl looks older than the one on The Goose Girl), though this is definitely a YA book. This is one of those "don't judge a book by its cover" cases!